Pitching a tent is an essential step to making your camping shelter efficient and comfortable. It is a good idea to practice pitching your new camping tent in your backyard before you leave on your family camping trip. You will then be familiar with how it goes together. This will save you time in the long run and you’ll find out if there are any parts missing or whether the tent is damaged. Setting up your tent before-hand will save you a lot of aggravation later on; and also prevent embarrassment at the campground. The three important things you should do when picking a spot: Look Up - Look Down - Look All Around! The best spots you will find are the tent sites that have already been used by previous campers and are bald and flattened. Placing your tent on bare ground will keep creatures from invading your tent. When pitching a tent, the safest place is near small, young trees or brush. Open areas expose your tent to rough, damaging winds, and places underneath large trees are in danger of lightning and falling branches. However, if the weather is warm and bugs tend to be a problem, a more exposed, windy area will help keep the pesky bugs at bay. Find as level an area as possible to place your tent. Choose a well-drained level space that is flat or gently sloping. Avoid depressions or low spots where rainwater may puddle under your tent. Carefully check around for any evidence of previous water runoff, for example, dry streambeds. Don’t set your tent up in a dry wash, or on a sandbar. A rain storm many miles away can cause a flash flood even if it isn’t raining near you. Be careful not to pitch your tent anywhere close to these areas. Never set up your tent next to standing water such as a stagnant pond or pool. Still water is a favorite haunt and breeding place of mosquitoes and other blood-sucking insects. If possible, avoid setting up your tent on the local vegetation. It is a wise camper who will protect and preserve the fragile plants. If you are staying in one place for a while, move your tent occasionally. You can help to prevent damage to the ground and vegetation underneath. A spot where your tent is shielded from the sun is always nice in the summer time. Try to choose a place where you will have shade during mid-afternoon. On the other hand, during colder months you may want to choose a site that is more exposed to the warm sun. Be careful to protect your tent from the damaging UV rays which are damaging to your tent over time. 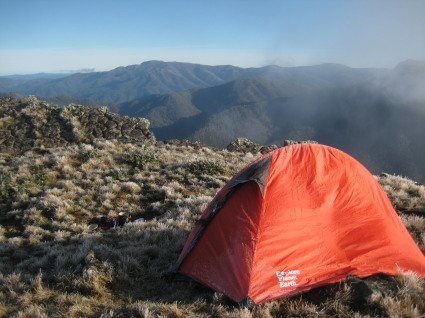 It’s good to arrive at your campsite as early as possible to get your tent set up before dark. Clear away all rocks, sticks and other debris before pitching a tent, those tiny rocks will feel much bigger at 3:00am! Be sure to remove sharp stones or plants which may damage the bottom of your tent. Check for garbage left by previous campers (for example: chewing gum). A rake may come in very handy for cleaning. Pitching a tent with the wind to the back of the tent and the door facing away from the wind. Or if you have a rectangular tent, place one of the back corners toward the wind. Place a tarp under your tent to protect it from the rough ground. It will also help reduce moisture. Make sure none of the material sticks out from underneath the tent, which will just channel rainwater directly under your tent. The tent anchors you will use depend totally upon the season and site. You can use pegs on ground that will hold them securely. However, on surfaces like bare rock, loose sand, hard pack dirt, or snow you may have to improvise. Suggested things you may try are rocks, roots, heavy packs, or stuff sacks. In deep snow, skis poles, ice axes, etc. may work best. After you set up the tent, make sure that the tent body and covering flysheet are correctly anchored and tensioned. This will ensure that you are protected from the elements. If all is secure, strong winds won’t move the tent.